Bleaching causes coral to lose its natural color and turn white. Hypotheses exist that increases in sea surface temperatures (SST) and hence, climate change, is the most common cause of bleaching over wide areas. temperatures (SST) are close to the higher temperature levels for coral survival, bleaching is predicted to become a yearly event by 2020. 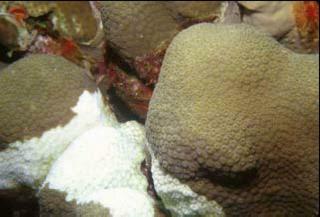 Bleaching happens when corals expel their symbiotic algae called zooanthellae. This causes coral to lose its natural color and turn white. Bleaching can be a reaction to a variety of stressors, such as changes in salinity, excessive light, toxins, and microbial infection. However, Continued on Page 15 hypotheses exist that increases in sea surface temperatures (SST) and hence, climate change, is the most common cause of bleaching over wide areas. This is because coral reefs are very sensitive ecosystems, especially to changes in water temperature above 30°C or below 22°C. Coral bleaching in the Caribbean is often spurred by a rise of at least 1.0°C in SST above normal summertime maximums with duration of at least two or three days. Global Warming is believed to be the chief cause of Coral Bleaching. Evidence suggests that the zooanthellae present in corals can recover and regain color within several months if the coral bleaching event is not severe. Otherwise, the coral dies. Multiple bleaching events in the Caribbean over the last several decades have resulted in widespread damage to reef-building corals and thus, decline in reef condition. According to the Status of Coral Reefs of the World: 2004 Volume One, the reefs of Belize began suffering from coral bleaching in June and August of 1994. Acropora was the species most affected. There has been a 50% coral reduction in live coral cover in Belize between 1997 and 1999, and cover has stayed relatively stable at that level with slow recovery. Many scientists agree that corals’ ability to adapt to the environmental effects resulting from climate change depends on the severity of other human stresses such as coastal development, over fishing, oil discharge, dumping of wastes, and pollution. A potentially effective management tool that Belize utilizes in reducing these stresses is marine protected areas (MPAs’).